About - copy - ZUMI. The first time it happened... I brushed it off. The fifth time it happened, I woke up on the floor of the clinic where I was working, worried faces of humans and dogs staring over me. This time, I knew something wasn't right. Long story short, I have a tendency to black out without warning, which obviously makes it impossible to safely work as a vet tech, handling dogs, needles, and assisting in emergencies. Virtually overnight, I had transformed from a veterinary professional to a workplace liability. My first step forward came, from all places, from an Australian pole vaulter who had experienced similar symptoms to my condition. She encouraged practicing yoga as a way to help. Although I wasn't interested in the 'woo-woo' aspects of the practice, the gentle stretching was one of the few ways I could still enjoy movement and exercise. Slowly without realizing it, I became immersed in the mental and spiritual benefits yoga as well. Word about the ZUMI lead spread quickly through the agility community and orders started coming in. 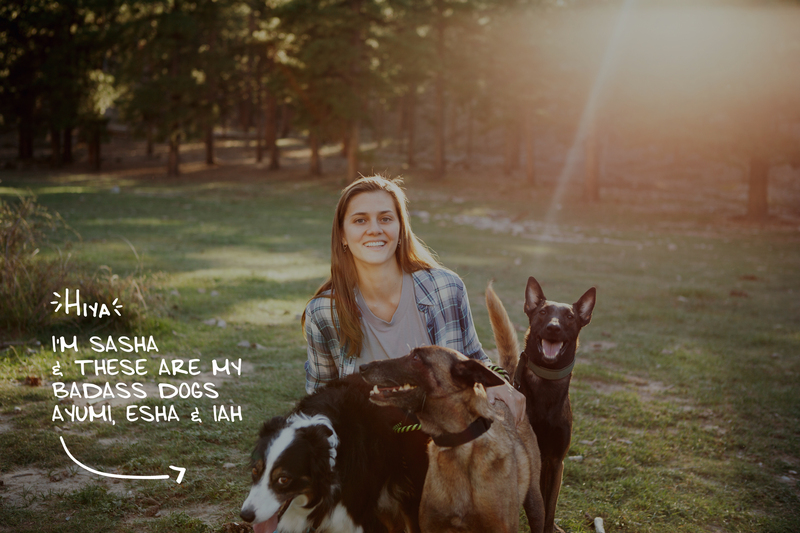 I slapped up a crappy website and a few leashes became a business. At first I thought, 'Well at least this is covering my trial entries' - but soon orders became overwhelming and I decided to really make a go of it as a business. My yoga practice started coming in handy as my path with ZUMI took it's twists and turns. I had to learn A LOT of things the hard way, all the while reminding myself that all good things take time. All this magic found its way into my life slowly and easily and when it appeared for the first time I didn't even know it. It was always there, pushing me during the tough times and motivating me during the good. Growth is a process. Now, nearly 5 years on, as I look back it's easy to see how one thing led to another and how things that were seemingly unrelated like yoga and dog leashes were all building towards something something bigger than myself, bigger than a business. Here at ZUMI our gear is different, because it's not just built to perform, but also to remind everyday adventure seeking dogs and their humans that in between all the go is the now. It's why ZUMI. exists and it's the driving force behind everything we do. I believe in living your intentions and I hold space for whatever that means from one person to the next (you do you, cause it's enough, full stop). I also believe that you are what you seek, so seek the good stuff. Take a cue from your dog and live in the moment. This one, here and now, cause forever is made up of nows. We're adventurers creating gear for like-minded adventurers and our aim is to make your journey safer and easier. Let us worry about keeping you two together so you can enjoy the little things (cause spoiler alert: the little things are the big things). Our products are manufactured both here in the US as well as overseas, but no matter where they are made, we work with ethical and sustainable factories.